Each day of the ride, the route will be marked with stand-up signs, chalk marking, and biodegradable arrows on the road surface. You will also be provided route maps and cue sheets. Rest Stops will supply you with snacks, lunch, water, Powerade, portable restrooms and a good cheer! 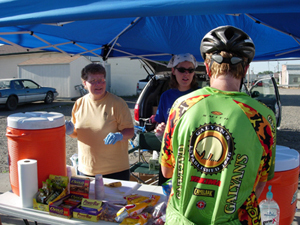 There will be 2 to 4 rest stops a day, strategically placed at 15-25 mile intervals. You can also shed your outerwear as the day heats up, leaving it with the SAG team or with the Rest Stop volunteers in bags you mark for yourself. Shed gear can be picked up in camp at the Rider Services booth each evening. It is recommended that you have your items clearly marked for your identification. Ride Idaho is not responsible for lost gear, or gear that is picked up by the wrong person. 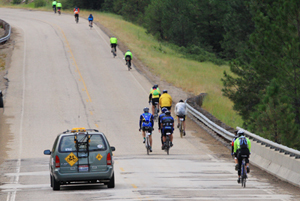 In addition to clear route marking and the support detailed above, Ride Idaho provides access to first aid and other support all along the route. Ride Idaho vehicles will be marked with the Ride Idaho logo, usually a window flag. The route support vehicles (HAM Radio Operators, SAGs, and Rest Stops) will also have Cyclist on Road signs to alert other motorists. Ride Idaho support vehicles will be driving the course throughout the day, providing assistance when necessary. In addition, first aid for minor medical needs, such as aspirin, moleskin, ointments, band aids, and so on are located at the information table in camp, at each Rest Stop, and within each SAG vehicle. Ride Idaho is prepared to call on the services of 911 throughout the ride for serious medical emergencies. In this section, we’ll review a few notes about our expectations--however, our biggest expectation is for you to have a fun, safe, trouble-free ride! Come to Ride Idaho physically and mentally prepared to ride the entire route. Wear a helmet, a rear safety blinking light, and a smile. Do not use earphones while riding your bike--this is not permitted on the route. Stay calm if confronted by a motorist, and contact the police. Be aware of your surroundings if you stop along the course. Inform someone such as a SAG driver, or HAM radio operator if you go off the route to explore or go swimming, hiking, etc. Remember, you are unsupported when you stray from the Ride Idaho route. You will be assigned a number when you check in at the start of the ride. Using the tags provided in your rider packet, please display this number on your helmet and bicycle so we can identify you along the route. Please click here to read the Idaho Department of Transportation’s Bicycle Code. Cattle Guards: Cattle guards are steel structures placed in the road bed to confine cattle to selected areas. They consist of a series of steel rails running across the roadway with gaps in between. The steel rails are usually slippery. If your wheel falls between rails you could experience a nasty fall. It is best to stop, dismount, and walk across cattle guards. Cattle guards are usually painted yellow or white and marked with a warning sign. If not, they can be recognized well in advance by an angled steel support on each end. Puncture Vine or Goatheads: Puncture Vine is also affectionately called Caltrop, Yellow Vine, and Goathead. The plant produces a fruit that easily falls apart into four or five single-seeded nutlets. The nutlets or "seeds" are hard and bear two to three sharp spines, 3/8”. These nutlets strikingly resemble goats' or bulls' heads and the "horns" are sharp enough to puncture bicycle tires and bare feet. Ride Idaho's number one priority is the safety of all our participants. We also know the caliber of rider that Ride Idaho attracts, so it's a bit like preaching to the choir. However, even the most responsible and law-abiding cyclists could all use a fresh reminder of bicycle rules and etiquette. The following covers a broad spectrum of safety information. It’s always a good idea to keep medical Information on your person when riding. This includes a photo ID, medical insurance card, notice of adverse reaction to medicine, and emergency contact information. In addition, you may want to carry a small personal first aid kit in a ziplock bag with some band-aids, alcohol wipes, and ibuprofen. If you have a strong reaction to bee stings, you should carry the appropriate medicine for treatment. Make sure that the helmet fits on top of the head, not tipped back or to the side. Find the smallest helmet shell size that fits over your head. Fit the helmet without the help of a lot of pads--don't make up for a size too large! Leave about a two-finger width between your eyebrows and the front of the helmet. Join the side straps under each ear, at the jawbone. Snug the buckle with your mouth completely open. A mirror on your helmet or on your handlebars is recommended. A red rear blinker light is recommended for use at all times on the road. A portable clip-on headlight is also nice for early mornings and evenings on the town. can be stored in a small seat bag or handlebar bag. Be predictable. Your actions affect those around you, not just yourself. Avoid surprise movements, whether side to side, while turning, or rapid changes in speed. Ride straight and at a constant speed. Signal your intention to turn or slow down before you do so. Hold left or right arm straight out to indicate left or right turn (alternate signal for right turn is left arm out and up). Hold left arm out and down with palm to the rear to indicate stopping. If you are the first rider in a group, call out right turns, left turns, and stops in addition to signaling. Announce turns before the intersections to give riders a chance to position themselves. Announce "car up" on when a car is oncoming. Ride to the right. Leave room for faster riders to pass on the left. Pass slower moving vehicles on the left; announce your intention to do so. Announce passes on the right clearly as this is not a usual maneuver. If you are the last rider in a group, frequently check for overtaking cars. Announce "car back" clearly and loudly. If you are the first rider in a group, announce slowing or stopping at intersections. Do not follow others through intersections without scanning. Be responsible for checking cross traffic. If you must stop, signal. On narrow road or during climbs, leave space between every three or four riders so that motorists can utilize the shorter passing intervals to pass safely. Create good relations with motorists. It is the responsibility of every cyclist to Share the Road! When stopping for any reason, always move clear off the road. Look and listen before getting back on the road. Move back onto the road as a group only when conditions permit. Always yield to traffic in the roadway. It is illegal in some areas to ride more than two abreast. Ride single file between intersections. You can double up when the group comes to a stop. When taking the lane, double up and take the whole lane. Drafting cuts down on wind resistance. Only draft off of someone whose riding style or experience you trust. Always inform the rider in front that you are on their wheel. Maintain space between you and the next wheel, at least 6" back. Do not draft on high traffic roads or roads with frequent intersections. Take turns 'pulling' the group along through the wind. Ride at the same speed as the rest of the riders. If you are stronger, spend more time at the front. To move from the front, check traffic, pull out to the left and move to the back. Do not slow down until you are completely clear of the rider behind you. The second rider is now the leader and provides draft for allotted time or distance. If you are the front rider, communicate obstacles to riders behind. If you are the last rider, watch the traffic behind and alert others. Pay close attention to those ahead and behind; be able to react safely and quickly. There is very little room for error when riding very close to others. If you crash in a paceline, there is a domino effect, so you may knock down riders behind you! Ride Idaho pacelines must not exceed six riders.